Words such as "feud" and "open warfare" are used to describe divisions at the top of government as ministers and MPs enter another week seeking ways to end the gridlock over Brexit. The Guardian claims Theresa May's government is "on the verge of meltdown" as cabinet ministers prepare to clash over whether to support plans for a softer Brexit and a possible lengthy delay to Britain's departure from the EU. With MPs about to vote again on a range of options, The Times says the prime minister has been warned that she risks shattering the Conservative Party if she bows to the will of the Commons, should it opt for a customs union arrangement with Europe. The paper says that under such circumstances pro-Brexit ministers have made clear they would consider resigning. "Tories at breaking point" - is how the i newspaper sums up the party's predicament. 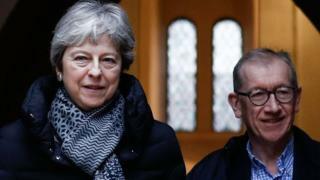 The Financial Times reports that ministers and Mrs May's most senior advisers are at loggerheads over the prospect of a snap general election to break the impasse. It says many MPs are aghast at the idea - put forward by some of the prime minister's aides - warning that it could result in a wipe-out for the Tory Party. Transport Secretary Chris Grayling has told the Daily Telegraph that the Conservatives must appoint a senior Eurosceptic to lead them through the next phase of the Brexit negotiations and must delay a full-scale leadership contest until after a general election in three years' time. The paper believes his comments will be seen as an effort to streamline the race to replace Mrs May, amid speculation that as many as two dozen MPs could slug it out in a campaign that could go on for months. "We are ready for power" is the front page headline in the Daily Mirror, which declares that Labour is primed to lead the country and take control of Brexit. The Daily Mail leads on what it calls the government's "radical shift in policy" on knife crime. The paper welcomes the announcement by the prime minister and the home secretary that they are taking a "public health" approach to what the Mail describes as an epidemic. But the Daily Express is not so sure. It says it has grave doubts about holding teachers, nurses and police to account if they don't spot the warning signs of young people who might go on to commit violent crime. The Daily Telegraph reports that the number of drivers caught speeding has risen sharply as cash-strapped police forces increasingly resort to roadside cameras for revenue. It says that more than two-and-a-quarter million motorists - about four every minute - were caught last year, up a third on the figure six years ago. It estimates that around a quarter of all British drivers have now been on a speed awareness course. And finally, it wouldn't be 1 April without the papers trying to fool their readers with some tall tale or other. So from the Sun we get news that the Royal Mint has revealed its latest coin collection - six themed 50p coins based on emojis such as a "thumbs up" and a "crying with laughter smiley".